There is a bit of a rare style of beer that has emerged in popularity in recent years called Gose. It’s a very peculiar brew made with top-fermenting yeast and inoculated with lactic bacteria, the same used in many sour beers. Besides this, there is a very unusual addition of coriander and salt to the brew. Salt… In a beer? This style is a regional specialty of Leipzig, Germany, leading me to believe that people in Leipzig are totally crazy. Because of these additions, they style didn’t conform to the Reinheitsgebot, the 16th century Bavarian purity laws that governed the brewing of beer. Besides being already unpopular, that was a first bullet dodged in the style’s history. The one brewery that made it was nationalized and closed in 1945 amid… harsh times, we’ll say. One person who worked there took the secret of brewing gose and passed it down, eventually allowing it to fade in and out of popularity until today. Now, there a few breweries doing this off-kilter beer in Germany, and even a few here in the U.S. trying their hand at it. Cascade does a few, Cigar City even had one, but perhaps the most interesting would be from the Widmer Brothers Brewery of Portland. In their classic and easily recognizable label, with a deep carmine pink, is their Marionberry Hibiscus Gose. With a subtitle touting, “Perfecting the Art of Tart”, I knew I just had to try it. Hey, I like hibiscus and corriander, marionberries aren’t bad, and a lactobacillus imbued beer has always piqued my interest. Of course, nothing on the label said anything about salt, but I wouldn’t think the Brothers would cheat me out of that experience. It pours a very dark, slightly opaque pink, almost the same color as on the label. The head is there, but not for long, leaving hardly any lacing. This almost looked like it was going to be one of those candy-like lambics, the type best complimented by a scoop of ice cream floating. The smell however, was more reassuring than that. True, there was some sweet berry to it, but the scent was dominated by wheat and floral hibiscus. There was also a bit of some light yeast. Nothing on the level of some Belgian styles, but still there. I readied myself for a hit of tartness, but found myself pretty over-prepared for it. It was somewhat tart, but was more a wheat beer than anything. You got some pretty good coriander notes at the end, which I was pretty happy with, but the stars of the show remained the berry and floral parts. Personally, tasting this left me with the impression that a traditional style gose would be a nice thing to drink. Something that makes this style interesting is the salt. There’s something about it that adds a kind of subtle savory characteristic to it. It is a sort of dryness, and I assume it does the thing salt does and amplifies the flavors. It is kind of unfortunate that such a strong flavor like marionberry was there to overshadow what could have been some really interesting flavors coming through. Gose is worth a try for it’s unique taste, and although I enjoyed this one, maybe start with another a more traditional one. Call me old fashioned, call me anachronistic, call me whatever synonym you want. I want a hawk. I don’t mean a hawk in a big cage or a hawk that visits a feeder full of woodland creatures I put out. I want an animal familiar, a big ol’ winged Raptor (biologically, yes they are a Raptor) to perch on a huge leather glove, flying off to catch vermin and carry messages. The feathers would have been a bonus to sell to hokum practitioners, but just recently eBay made selling magic spells against the rules. If I wasn’t already certain eBay is a cabal of dark wizards, this would have sealed it. The fact that the practice of falconry has fallen so out of favor is a testament to how lame we’ve gotten as a species. Some falconers will even keep Golden Eagles. Could you imagine having a beast with a seven foot wingspan? Yes, Hawks are pretty darn cool, despite being largely ignored as a pet option. 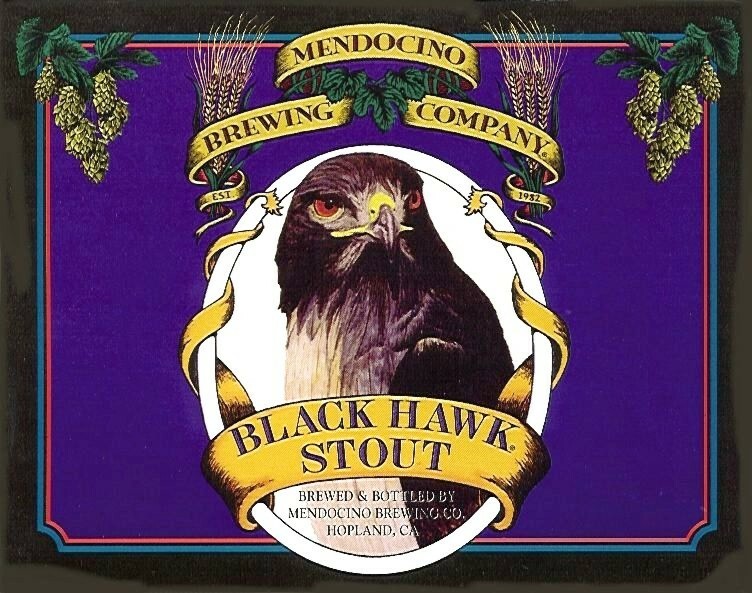 Luckily, the Mendocino Brewing Co. has a close second: a hawk themed line of beer. Their “Select Collection” has Eye of the Hawk American Ale, White Hawk Select IPA, and the one I tried, Black Hawk Stout. Their website categorizes it as a classic Irish-style dry stout, with an ABV of just 5.2%. It’s been a little bit since I’ve reviewed a stout, so I thought it may as well been this one. These come in regular six-packs, but I’m not sure what they are going for these days. Mine was from a restaurant, but I can’t imagine it being more than around ten bucks. The bartender poured it out into a chilled sort-of pinched weizen glass. It’s a bit of a peeve of mine when a beer is served over-chilled, but I can’t expect everything from everyone. It poured a very pitch black, with a nice couple fingers of brown head. I was really torn on whether I should give it a taste now and compare it later, or taste it after it has warmed up a bit. I decided (mainly because I had time before the food came) to let it sit for a minute or two, at least until it gets up to around cellar temperature. I figured I would miss out on those initial impressions, or at least the strength of them. When I did give it a smell, it was very textbook stout. The taste was very excitingly malty, mostly coffee and chocolate flavors. There was a bit of a sweetness, a bit fruity like dates. There is a bit of a hint of bitter hops at the end, contributing further to that ‘parched’ mouth some stouts will give you. This is an effect that I’ve always had a personal love/hate relationship with. On one hand, your mouth feels all dry and icky, which is bad. On the other hand, it makes you want another taste of beer even more, which gives that kind of “hunger is the best spice” delayed gratification thing. I haven’t really heard many other people mention it, but it’s something I always take into account when drinking a beer like this. Overall, a pretty alright stout. It’s pretty indicative of the style, it’s very drinkable, and it is a good accompaniment to food because it’s not so heavy that it’s filling. If you’re doing a flight of stouts and you want something to represent Irish-style or dryness, this is a fine example. Fun Fact: Did you know you can switch the language on your Facebook to Pirate? Basically changes “Friends” to “Mateys” and “like” to “Yarrr”, doofy stuff like that. Yes, people do this. So if you’re super into this ‘Pirate Lifestyle’ (which I guess, if Vince Vaughn comedies are to be believed, exists? ), you can browse your pirate facebook, scarf down some Pirate’s Booty puffed corn, and drink something that is actually pretty good. Of course, I am talking about Ballast Point Brewing Co.’s Tongue Buckler. Now you may think, “Tongue Buckler? Is this some kind of palate-destroying hop bomb that our beloved Mitchell warns us against?” Well, firstly never question me again, please. Secondly, no. Thirdly, it’s MISTER Wilburn, thank you. 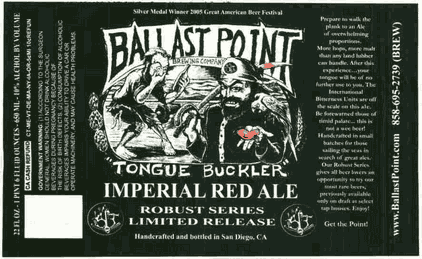 Tongue Buckler is one of Ballast Point’s Robust Series, specifically their Imperial Red Ale. I’ve had good experiences with their Imperial Pale Ale, so the idea of one with some nice red malty goodness is pretty inviting. It’s got a 10% ABV, and a pretty hearty 107 on the IBU scale. For the uninitiated, the IBU (or International Bittering Unit) measures just how bitter a beer is. For example, a boring ol’ adjunct lager is somewhere around a zero; your average IPA, somewhere upwards of 70. It just goes up from there, flying towards the sun on hoppy, waxen wings like so many Icaruses (Icarae? Icarii? Help me out here). Despite this, there is still a strong market for lovers of beers that are well balanced and high in hops. The craft beer community may be approaching a nadir in the backlash of this IBU arms race, thanks to a few fed-up and foreboding Daedalus…es (Boy English is fun). Heck, I’ve been saying it all along! Everyone,you can just crown me King of Beer for working that one out for you (you’re welcome). Whew, ok enough talking like a clown with a problem in his brain. Let’s get drinkin’. It is a clear, hazelnut amber color, with a very big, foamy beige head. The head was so thick that it almost peaked like a whipped meringue. Dang, now I’m thinking how good an Imperial Red Ale meringue would be on a pie. DANG. It gives off a deliciously malty nose, with an equally big hit of resinous hops. The malt is almost toffee-like, very sweet smelling. Something noticeable and rare for the scent: very well balanced. The first taste, you get a big bitter tightening all over the tongue. The “buckling” as it seems. A touch more floral and piney than they nose would lead on, but still very much resinous. There is even a bit of citrus in there, making for quite a complex hop arrangement. Towards the end of the taste you get more of that sweet toffee malt, but with a pronounced nuttiness. The more sips you take, the more it starts to balance out, giving more of a molasses and toasty flavor from the malt. Even to the end of my 8oz pour, there remained a little puck of super-dense head lending a bit of creaminess to each taste. Enjoyable, but not unnecessary with such a full bodied and just slightly slick mouthfeel. An interesting style and a great beer for those who love big flavor. Oh, and hey, there’s a pirate on the label! You know, I usually don’t have that high of standard for a “British” pub. People get their pints, they get their shots, and they get their banger-in-the-mouth (us yanks call them a sausage-in-the-mouth). As such, even when the tap list is fairly robust in size, they rarely stray from the lagers, ciders, and Guinness. I went to one the other night, nothing all that special. There was one that I actually haven’t had before, with a fairly nondescript name of Abbot Ale. Typed it in to my phone, saw Beer Advocate rated it at an eighty-three. Not bad, not bad. So I called over the waitress and ordered one Imperial Pint (a little shy of 20oz). Delving a little deeper into this beer, the Greene King website describes it as having “masses of fruit characters, malty richness, and superb hop balance.” Ah, it’s going to be one of those kinds of ales? I immediately thought of some very religious ales I’ve had that fit the bill. Like those other ales, I know that they are usually pretty remarkable on tap. When it got to my table, it was very inundated with those little ‘fisheye’ bubbles tap beers will get. Because of this, it was a dark reddish amber color at the bottom, quite clear, and a hazy light cafe-au-lait color near the top. Just above that was a stark white and massively creamy head. It was that super-rich head you get with good English beers, almost as flat and solid as porcelain. If nothing else, a darned picturesque beer. The head stayed for pretty much the whole beer, and left very thick lacing all the way down the glass. That’s one of the things I like about Abbey beers, they get really really into things like clarity and consistency and lacing, and crank them up to eleven. Personally I’ve always been more of a uniqueness and complexity guy, but I can definitely appreciate the craftsmanship that it takes to make something like this happen on cue. The nose to it was very malty and sweet, lots of toffee notes. Perhaps… English toffee? Oh, I do think so. There’s also a bit of that fruity bit of malt and yeast marriage, a bit like dried plums. No real hop note to the nose, but I could see it getting lost in this malty sweet cloud. The taste was surprisingly and refreshingly complex. It followed the nose in the sweet toffee malt and sugary stone fruit notes, but it also had just a touch of citrus hops. There is even a bit of bitterness, not unlike a woody or tobacco note. You mainly get these in the breath after the gulp, but they are enjoyable none the less. More often than not I was licking my lips and really savoring the taste left after. The mouthfeel was pretty indicative of the head, very creamy. Not thick, but not super watery. Overall, very easy to drink, not too tiring in any way, and still quite identifiable British. It’s good to know that in the world of so-so British themed pubs, there will be some mainstays that are truly solid, great beers. I know what I’ll be ordering next time, and now maybe you can have something to pick out in a list of vaguely familiar English beers. We’ve all seen this one. Usually in a grocery store, with two others from the same brewery. Well, it was National IPA day, “The Bitterest Day of the Year” (that one’s all me), so I picked it up. I mean, what’s the worst that can happen? I crack it open and a meteor ends all life on earth? Yes, I suppose that is the worst, but very/mostly improbable. I mean, who would know? It could happen right… NOW. Ok, we’re still here. Well, that’s good enough reason in my book to have a little celebratory drink. Oh and look, Longhammer IPA, don’t mind if I already did. I picked up this one on sale, in honor of this national day of hops. It mostly comes in bottles, but mine came in one of those horrible plastic six pack things. You know the ones; turtles won’t get caught in them, but you have to practically kick and punch your beer out of it? You know, I always used to cut up my old style six pack holders and now I have to deal with this? I demand one guilt-free turtle death by my hands. You know where to reach me, Mother nature. ANYWAY. Longhammer IPA, as described by Red Hook’s website, promises that “the medium body, crisp finish, and moderate Alcohol and IBU levels makes this one of America’s most drinkable and best-selling IPAs.” Regardless, I’ve given them the benefit of the doubt this time. It falls into a category of beers I’ve never had too much of a problem with, and that is what I call “Grocery Store Premium”. These are the beers that they have at nearly any grocery store in the country. The highest of the low-denominator. Pyramid is another one if these I see often, and Fat Tire has quickly became one as well. Hey, as long as they are funding some of their cooler, more risky stuff, more power to them. I ripped this one out of the holder and poured it into my Batman pint glass, and was interested at the slightly opaque light orange color. Along with the very fluffy white head, it is a pretty picture for an IPA. The aroma however, is pretty weak. No strong, pine scented hit to the proboscis, just a little waft of orange citrus and malt. The taste was slightly more reassuring, but not thrilling. Sure, there were hops, if you want to get technical about it. A tad bit resinous, a bit floral, very much more citrus than anything else. Plenty of sweet malt too. Almost too much, if one was really looking for that “IPA experience”. In fact, there was really more in common with just a regular ol’ pale ale than an IPA. Bare bones, this is an ‘alright’ beer. There is a good balance, if not a bit homogeneous. Being rather thin and high on carbonation doesn’t help either. There are a ton of beers I’d rather buy a six pack of, just in general. Judging this as an IPA is even less forgiving. Hardly any bitterness, too much malt for the style. At least the hop profile was defined enough. And again, just too too watery. I guess I’ll have to wait next year to get a good IPA for IPA-mass, because ol’ Saint Hoppy didn’t visit my house this year.